May I set Memory Clock to a lower value than default in new Radeon Software Crimson ReLive Edition 17.4.4 ? I have an issue with my Sapphire Radeon VAPOR-X R9 290 4GB - black screen when idle. In games it works perfect. Setting Memory Clock to 1225 MHz (1400 default) solves "black screen" issue. Seems I'm stuck with v16.9.2. You have another issue ...the drivers work fine for me. My bet is you have screwed around with clocks,fans, temp, etc. Delete all the third party graphics controllers (Asus,MCI,Trixx,Afterburner,etc,etc). They conflict with Wattman settings. 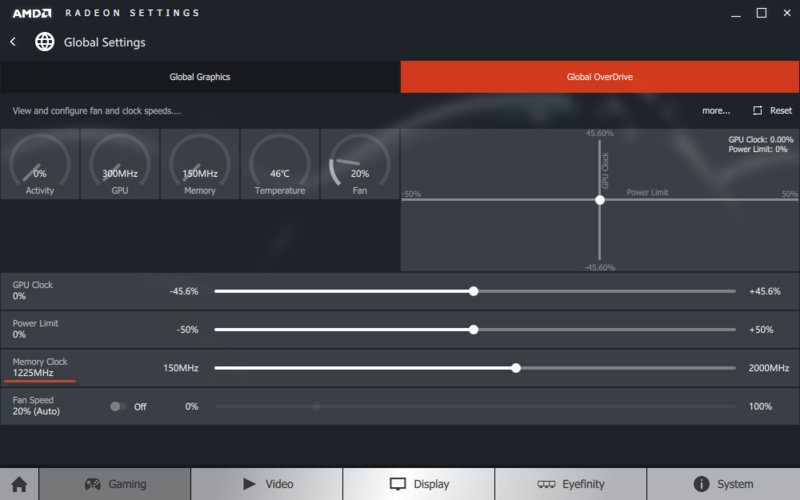 Set your AMD control panel back to default to undo any/all the changes you made. Everything else at default....automatic. Simple. Delete all the third party graphics controllers (Asus,MCI,Trixx,Afterburner,etc,etc). AMD drivers only. Nothing else. This issue is popular for amd-card owners. People think this slider is for setting "Target Temp"..it's not..it should read MINIMUM. Never change from the minimum...set your MAX at 80c. Leave all other controls at default. Your fans will become involved at 45c and gradually increases as the temperature rises. Wait. I'm getting a black screen when system is doing nothing and cold (~45c). How changing power limit can help with this? Do you think changing power limit will help? Did you change clock speed? Yes it will help...and make sure your COMPUTER power plan is set to 'performance'...not 'balanced'. Unfortunately, all this doesn't work.